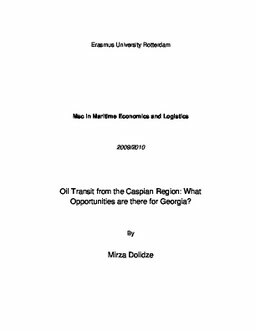 Erasmus University Thesis Repository: Oil Transit from the Caspian Region: What Opportunities are there for Georgia? Oil Transit from the Caspian Region: What Opportunities are there for Georgia? The objective of this paper is to study the effects of cost factors involved in the transportation of Caspian region crude oil. The region is landlocked and far from the major petroleum consumer markets of OECD countries. However, proximity of Caspian and central Asian countries to the booming China has in the last decade loosened the location constraints. Despite the high transportation costs and transit time on various modalities of pipeline, short sea and railway routes used to get the petroleum to the markets, Caspian oil is playing a stabilizing role in the markets and will increasingly do so in the following decade to come. It is no wonder the giant oil producing companies grew keen to set up their businesses in the regional energy sector since leading oil producers of the area, Kazakhstan and Azerbaijan, gained independence and opened the oil sector for investments. Pace of development in these countries is largely dependent on the efficient and stable recovery practice of their vast oil and gas reserves. The picture is charged by the active involvement of world and regional power states. The USA, EU and Russia backing of various transportation routes affect the pattern of oil flow directions. The competition in new route initiatives is also intensifying. At present, existing pipeline routes to the north (Russia), South (Azerbaijan, Georgia, Turkey) and East (China) offer ample capacity to the major oil producers of the region. Based on costs of transportation and available capacity they can select most cost efficient ones. However, quantified route and transit country specific risks can also be accounted for. Risk indexes and Network flow analysis is applied to measure the effects of socioeconomic and concentration factors in optimizing the export routes. Model scenarios show that the diversification among pipeline routes with more quantity of oil allocated to the northern direction and considerable weight given to southern corridor railways mode might be the best choice.